Two Bedroom: Queen in master, twins or queen in second bedroom, queen murphy bed in living area. Maximum occupancy 6. I love to travel and help others fulfill all their traveling needs! We enjoyed our stay here. Check in we just like any place. Someone at front desk 24-7. There's a secure underground parking garage which we didn't know about the first night. The surrounding area is fine. Didn't see anything bad going on. The train runs right by but it wasn't too distracting. There is a Mels diner right around the corner. The room was as pictured. Our 2bd was even bigger than I thought. Great having the equipped kitchen. Dining table was even big enough for 6 to eat at! Loved the fireplace! No fsn channel on the tv so we missed an MLB playoff game, but Joe at the front desk went out of his way to apologize and let us know we would be able to watch the next one! Beds were comfy. There's is a Murphy bed in the living room that pulls down with plenty of room and we left it out for extra "seating" while we were hanging out in the living room! The facilities were ok. Rec room was cool. 2 pool tables and air hockey as well as a big screen TV. Arcade room had 3 games. We didn't use the pool....too cold, it's October! I'd say the only negative was the hot tub. Its tucked in an uninviting outside corner and the concrete at the bottom looked dirty. We opted not to get in. All in all, the room/apartment was so much better than a hotel/ casino. We were meeting family who were staying at a different place and it was great having somewhere for us all to hang out that felt homey. I feel like we got a good deal as the price has gone up since we stayed here. I would recommend it if you do not want the noisy hustle and bustle of a casino. Easy check in. Nice, clean and quiet. Enjoyed our stay. Thank you for renting us the property. It was great. Samona checked us in, and even called us to make sure everything was okay with our accommodations. The condo was cozy and comfortable. We loved the hot tub after a long day of vacationing. I would definitely use this vacation property again. Glad you liked the resort so much and enjoyed your stay in this condo! Thanks for being such a great guest and thanks for the kind review as well! Hope to hear from you again soon! Take care! This was a 1 day stop en route but the apartment was perfect. Nice appointments, great view, close to a number of casino's (easy walking distances), and exceptionally comfortable. Front desk staff warm and friendly. If staying in Reno this is the place to be. After 5 hours of straight driving to Reno, arriving at 10 p.m., we were SO thankful for an easy check-in. The suite was wonderful. Anything we could have wanted for an extended stay. Unfortunately, we were just there for a one day conference so only spent the one night. Everything was clean. The beds were very comfortable. Thanks for offering such a great place to stay. Great for over-night. Perfect for extended stay. Little has changed from the time when Reno became the birthplace of Nevada gambling. 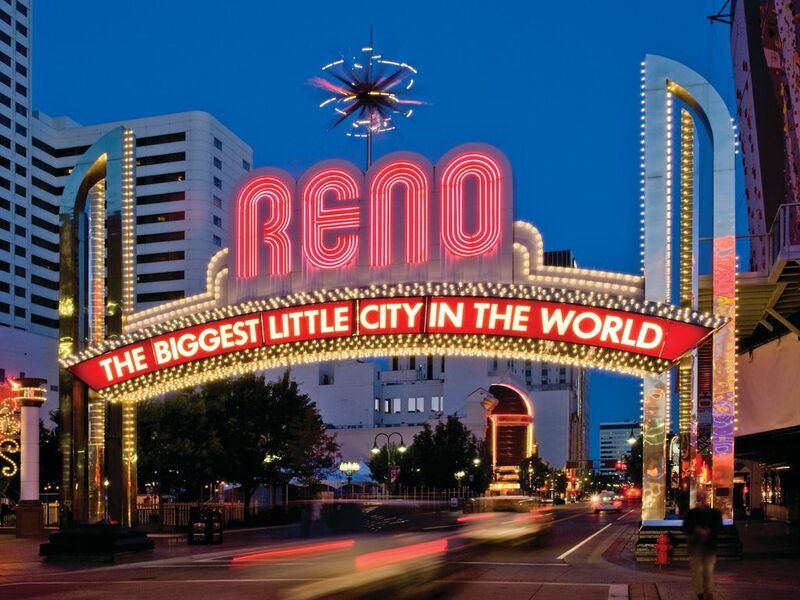 People remain pressed around the tables in casinos and that sweeping arch still spans the main drag proclaiming Reno "the biggest little city in the world." But there’s more to Reno than gambling and entertainment. History still streaks this town like veins of gold through hard granite. Relive the area’s wild gold-mining days with a trip to old Virginia City. For the nature lover in your group, there’s plenty of recreation. From hiking in the Sierra Nevadas to skiing at Lake Tahoe. In fact, there’s a little something for everyone in Reno. While nature lovers are out traipsing around in the desert, those who want to stay cool, can do so in the air-conditioned halls of the National Automobile Museum. This unique museum features vintage cars in authentic street settings. Come discover more of this town’s wild past and claim some memories for your future. Take to the slopes on skis or snowboard at this world-class downhill ski resort located in Lake Tahoe, Nevada. The village also offers excellent dining, nightlife and gaming. The 105,000-square-foot facility features four exhibit galleries dedicated to the history of the automobile from the turn-of-the-20th-century to the modern era. The museum also has a changing exhibits gallery, which displays a series of automotive-themed exhibits. Open daily except Thanksgiving and Christmas. ½ mi. Founded in 1904, Nevada’s oldest museum is dedicated to collection, preserving and exhibiting Nevada’s history. The museum collections of the Nevada Historical Society include more than 15,000 artifacts and works of art. Open: 10 a.m.-5 p.m. Mon.-Sat. 2 mi.